GAMSAT grinds: From simple concepts to GAMSAT level. Get excited about learning again! GAMSAT Courses Dublin by Gold Standard celebrates another successful year at the National College of Ireland (NCI) by expanding from 4 full days of class to 7 full days, with no tuition fee increases. Please note: NCI is our venue for our Dublin GAMSAT courses/grinds. Our courses hold no affiliation nor have we sought or received endorsements from the NCI. Now, in our 9th year, we offer you the opportunity to specifically address any area in your GAMSAT prep that requires improvement by attending one full day of our interactive GAMSAT courses for just €149, which includes course handouts. For the price of hiring a GAMSAT tutor, you can be taught by the author of the first GAMSAT textbooks, ever. From our free monthly webinars to our extensive 70+-hour GAMSAT Video Library (included in our Complete Course below) to our unprecedented 60+-hours of class time for our live GAMSAT Courses in Dublin, come learn from our experience. You can now choose a problem-based learning (PBL) GAMSAT course based on your needs, availability and budget. Payment plans are possible for course packages 7 and 8 in the table below and they both come with the Home Study Course which includes the Gold Standard GAMSAT textbooks, MP3s, flashcards and more. Both the Home Study Package and textbooks are also available separately should you wish to customise your own GAMSAT course. All Science Review days and all Practice Test/Review days are from 9 am to 5 pm. Click any link below to reveal course details including daily schedules and the option to purchase. All materials available separately; also available at UCD (The Campus Bookshop), UCC (John Smith's Bookshop), Hodges Figgis and Clarendon Medical. Meet weekly for an hour with a small group online with Dr. Ferdinand to focus on GAMSAT strategies and improving your weaknesses. Try a Section 2 Written Communication essay in class. Plan your essay and discuss strategies, formatting, and ideas for your essay. 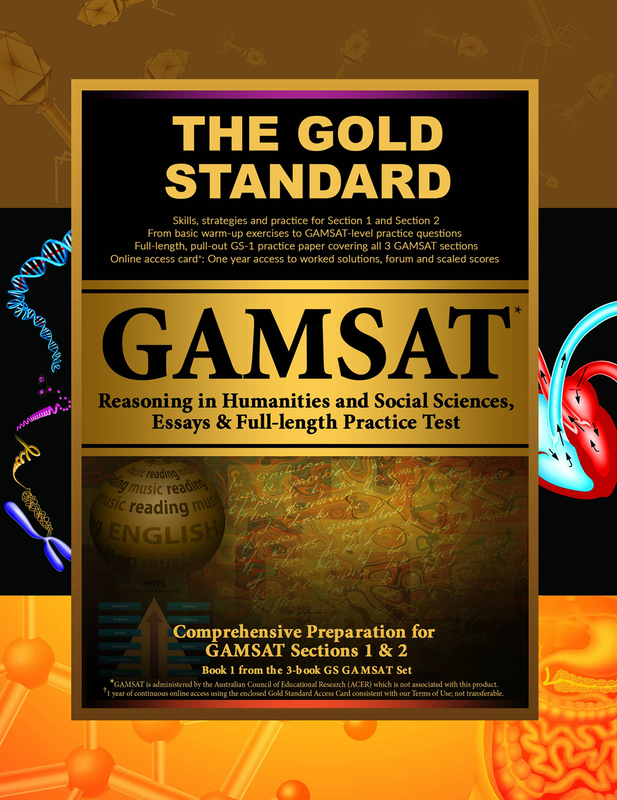 Also, try a sample of GAMSAT-level Section 3 (science) questions and get insight into efficient preparation, strategies, and approaches relevant to GAMSAT-level practice questions. Book your seat for this free 1-hour GAMSAT class now! 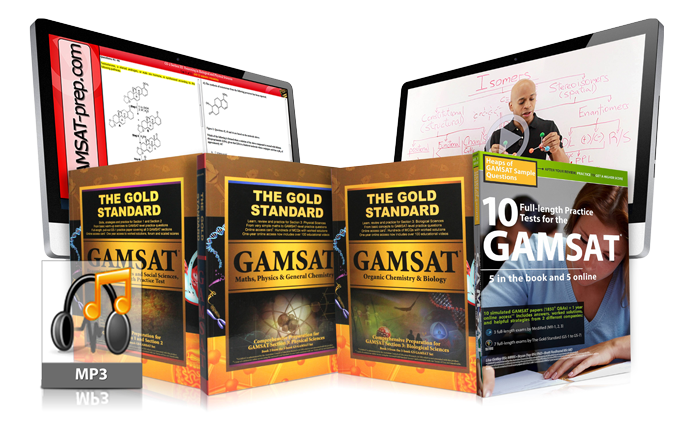 Note: It is not necessary to be using Gold Standard GAMSAT products in order to attend this free GAMSAT seminar. You will receive a free handout but please bring some writing paper. Attendance of this free GAMSAT Strategy Session is not obligatory if you are attending our Science Review courses. 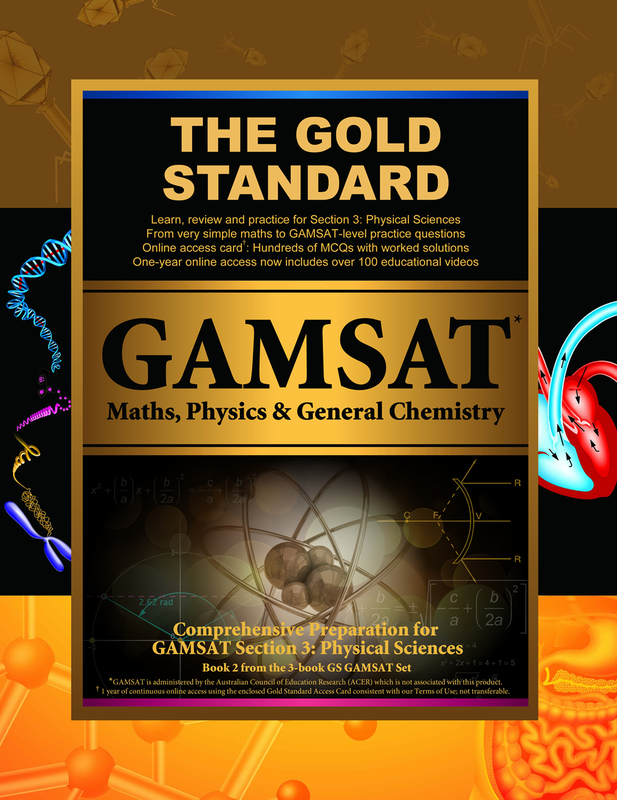 The Gold Standard GAMSAT textbooks are available at your local uni bookshop as well as gamsatpreparationcoursesireland.ie. BRAND NEW free 1-day bridging course: In the morning, science students can review Section 1 and 2 practice and strategies. Non-science students cover basic science to prepare for the next 2 days of review. In the mid-afternoon, both groups review GAMSAT graphing with practice questions and worked solutions (PBL). Parking There is an underground car park at NCI. The day rate 8am to 6pm on a Saturday and Sunday is €5.00 and €2.50 for every additional hour. Student accommodation is not available at this time. There is an on-site restaurant on campus. *Last minute registrants should arrive at least 15 minutes before class begins with payments in the form of certified cheque, cash, or money order. Please bring your ACER GAMSAT practice booklets (or e-book access with your electronic device or print-out) so that if time is left at the end, worked solutions can be presented in class. Our Dublin GAMSAT courses hold no affiliation nor have we sought or received endorsements from the National College of Ireland. A GAMSAT Mock Test review follows the next day. You will have the option to watch the worked solutions with Dr. Ferdinand in Brisbane via Wiz IQ (live video feed), or recorded later. To watch the live class, you will need to sign-up for a free Wiz IQ account. The direct link to the class will then be emailed to you and then you can watch on your personal computer. You can submit questions by typing which will be relayed to the classroom live. After the mock exam, all students will be provided with online access to worked solutions to every practice question in their mock exam (GS-4). Park There is an underground car park at NCI. The day rate 8am to 6pm on a Saturday and Sunday is €5.00 and €2.50 for every additional hour. GAMSAT Dublin: Greatest Hits Mock Exam March 16! Free worked solutions: You will be given online access to detailed worked solutions to all questions for you to review at your convenience. You will also have free GS GAMSAT Forum access so that you can ask one of the exam's authors any questions you might have. Alternatively, you may call 612 8005 0922. For students purchasing the Live GAMSAT Science Review Course (€399), Practice Test + Review Course (€399), GAMSAT Home Study Package (€399) and 8 GAMSAT Essay Correction Service (€175) at the same time, you can have this complete GAMSAT course preparation at a discounted rate of €1100 (approx. €200 off). Postage of the Home Study Package is free for Ireland and the UK. You will receive your Home Study Package within a few days of payment while online access is instant which includes your essay-writing schedule and unlimited access to our Video Library within your 1-year access period. You can change the city that you are registered to attend a live preparation course or you can book a live (online) attendance by informing us at least 1 week in advance. Only if you cannot attend class in person, you have the option of watching the class live (online) or you can watch a recorded version which you would have access to until the next sitting of the GAMSAT. New offer for only €320 extra: Get an additional 10 GAMSAT Online Tutorials every Sunday at 10 am GMT during the 10 weeks before the real exam. For 7 full days, join us to expand your knowledge, develop your reasoning, and learn new strategies. You will receive online access immediately after payment which includes your essay-writing schedule and access to our Gold Standard Video Library with over 300 videos. Thereafter, you will receive the Home Study component of your course materials within a few days. You can also choose to attend the 7 full days of Live Courses within 2 years of your purchase. Only if you cannot attend class in person but can provide us with at least one week’s notice, you have the option of watching the class live (online) or you can watch a recorded version which you would have access to until the next sitting of the GAMSAT. Payment plans are possible (see Contact Information). This course also comes with a GAMSAT Score Guarantee: get the score you want or repeat online access for free (up to 1 additional year of access). Your Guarantee also permits you to complete your 16 essays within 2 years if needed. • Note: if you intend to purchase 5 or more days, it may be more economical to purchase our 6 or 7-days GS GAMSAT Course. Your 2019-2020 Ed. 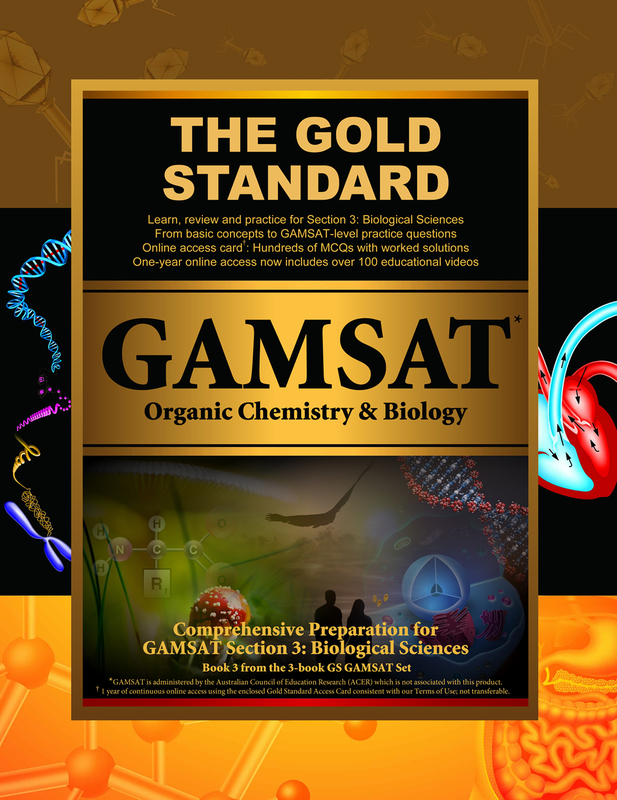 GAMSAT Home Study Package provides clear teaching and reviews all of the topics that ACER requires you to know for the GAMSAT (science, verbal and written): 3 Textbooks + 10 Full-length Mock Exams (5 in the book and 5 online) + Online Science Videos + Flashcards! 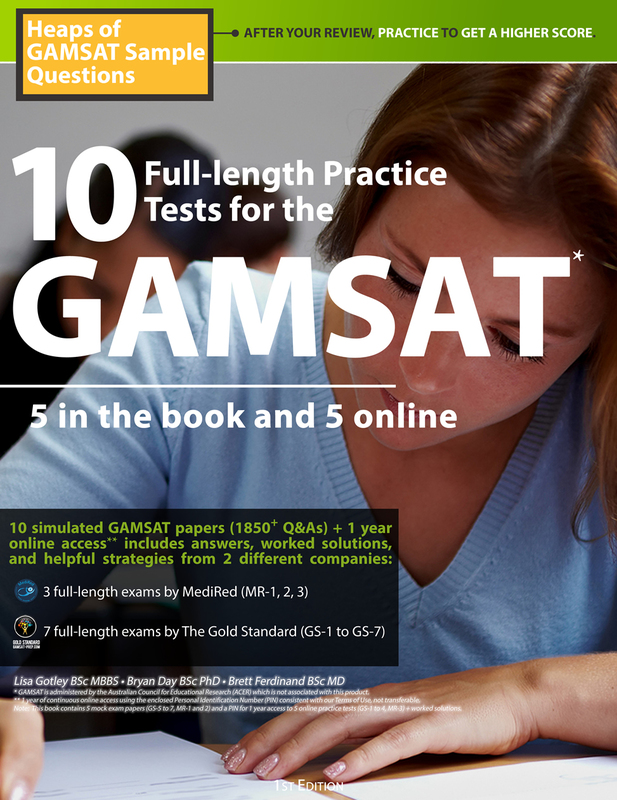 The 10 full-length GAMSAT practice tests that come with this package include helpful, worked answers. "I just wanted to let you know that the Live Course was superb - it was definitely the best investment of both time and money that I have made during my study for the GAMSAT.​ I received my GAMSAT results today from the Irish sitting and obtained a 64 overall including a 66 in the science section." "Just wanted to let you know that Kirsty starts Graduate Entry Medicine at her first choice university, Royal College of Surgeons in Ireland. Her only preparation was your system for 5 weeks prior to the exam."